Became first President of Egypt. The Kingdom of Egypt (Arabic: المملكة المصرية‎ Al-Mamlaka Al-Miṣreyya, "the Egyptian Kingdom") was the de jure independent Egyptian state established under the Muhammad Ali Dynasty in 1922 following the Unilateral Declaration of Egyptian Independence by the United Kingdom. Until the Anglo-Egyptian treaty of 1936, the Kingdom was only nominally independent, since the British retained control of foreign relations, communications, the military and the Anglo-Egyptian Sudan. Between 1936 and 1952, the British continued to maintain military presence and political advisers, at a reduced level. In December 1921, the British authorities in Cairo imposed martial law and once again deported Zaghlul. Demonstrations again led to violence. In deference to the growing nationalism and at the suggestion of the High Commissioner, Lord Allenby, the UK recognized Egyptian independence in 1922, abolishing the protectorate, and converting the Sultanate of Egypt into the Kingdom of Egypt. Sarwat Pasha became prime minister. British influence, however, continued to dominate Egypt's political life and fostered fiscal, administrative, and governmental reforms. Britain retained control of the Canal Zone, Sudan, and Egypt's external protection' the police, army, the railways and communications' the protection of foreign interests, minorities and the Sudan pending a final agreement. Representing the Wafd Party, Zaghlul was elected Prime Minister in 1924. He demanded that Britain recognize the Egyptian sovereignty in Sudan and the unity of the Nile Valley. On November 19, 1924, the British Governor-General of Sudan, Sir Lee Stack, was assassinated in Cairo and pro-Egyptian riots broke out in Sudan. The British demanded that Egypt pay an apology fee and withdraw troops from Sudan. Zaghlul agreed to the first but not the second and resigned. Britain used Egypt as a base for Allied operations throughout the region, especially the battles in North Africa against Italy and Germany. Its highest priorities were control of the Eastern Mediterranean, and especially keeping the Suez Canal open for merchant ships and for military connections with India and Australia. The government of Egypt, and the Egyptian population, played a minor role in the Second World War. When the war began in September 1939, Egypt declared martial law and broke off diplomatic relations with Germany. It did not declare war on Germany, but the Prime Minister associated Egypt with the British war effort. It broke diplomatic relations with Italy in 1940, but never declared war, even when the Italian army invaded Egypt. 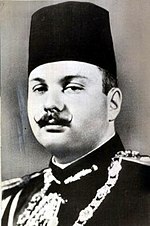 King Farouk took practically a neutral position, which accorded with elite opinion among the Egyptians. The Egyptian army did no fighting. It was apathetic about the war, with the leading officers looking on the British as occupiers and sometimes holding some private sympathy with the Axis. In June 1940 the King dismissed Prime Minister Aly Maher, who got on poorly with British. A new coalition Government was formed with the Independent Hassan Pasha Sabri as Prime Minister. Following a ministerial crisis in February 1942, the ambassador Sir Miles Lampson, pressed Farouk to have a Wafd or Wafd-coalition government replace Hussein Sirri Pasha's government. On the night of 4 February 1942, British troops and tanks surrounded Abdeen Palace in Cairo and Lampson presented Farouk with an ultimatum. Farouk capitulated, and Nahhas formed a government shortly thereafter. However, the humiliation meted out to Farouk, and the actions of the Wafd in cooperating with the British and taking power, lost support for both the British and the Wafd among both civilians and, more importantly, the Egyptian military. ^ Article 149 of the 1923 Constitution. ^ Bonné, Alfred (2003) [First published 1945]. The Economic Development of the Middle East: An Outline of Planned Reconstruction after the War. The International Library of Sociology. London: Routledge. p. 24. ISBN 978-0-415-17525-8. OCLC 39915162. Retrieved 2010-07-09. ^ Shousha, Aly Tewfik (1947). "Cholera Epidemic in Egypt: A Preliminary Report". Bull. World Health Organ. National Center for Biotechnology Information. 1 (2): 371. PMC 2553924. PMID 20603928. ^ Michael T. Thornhill, "Informal Empire, Independent Egypt and the Accession of King Farouk." Journal of Imperial and Commonwealth History 38#2 (2010): 279-302. ^ Steve Morewood, The British Defence of Egypt, 1935-40: Conflict and Crisis in the Eastern Mediterranean (2008). ^ S. K. Rothwell, "Military Ally or Liability? The Egyptian Army 1936–1942." Army Quarterly & Defence Review 128#2 (1998): 180-7. ^ John Marlowe, A History of Modern Egypt and Anglo-Egyptian Relations, 1800-1953 (1954) p 313-15. ^ Marlowe, A History of Modern Egypt and Anglo-Egyptian Relations, 1800-1953 (1954) p 315-19. Botman, Selma. "The liberal age, 1923–1952." in M.W. Daly, ed. The Cambridge History of Egypt, Vol. 2: Modern Egypt, from 1517 to the End of the Twentieth Century (2008), pp 285–308. Goldschmidt Jr., Arthur. Biographical Dictionary of Modern Egypt (1999). Marlowe, John. A History of Modern Egypt and Anglo-Egyptian Relations, 1800-1953 (1954). Rothwell, S. K. "Military Ally or Liability? The Egyptian Army 1936–1942." Army Quarterly & Defence Review 128#2 (1998): 180-7.